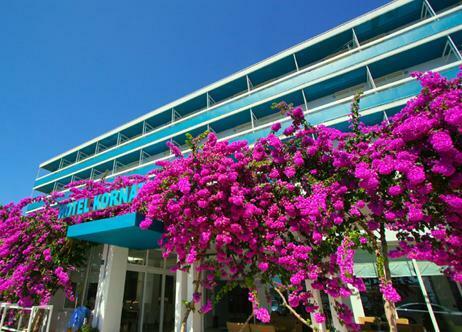 Kornati is the third hotel of the Ilirija Hotels, and is located in the center of Biograd na Moru, as well as near local beaches. Its exterior and interior were designed to resemble National park Kornati, which can be seen through most of the hotel windows. The hotel also has its own marine, so you can sail to Biograd na Moru and hotel Kornati, if you wish so. The hotel provides an excellent vacation and entertainment for the whole family, with daily organized field trips and recreational activities for all generations. Pets are allowed on hotel grounds, so you don`t need to worry about what to do with your cat or dog when you`re on vacation. Kornati is a four star hotel, and is open from March to December. It has four floors with 102 rooms and 4 suites which have a total of 220 beds. All rooms are modern and equipped with everything you might need during your vacation. There are two functioning and modern elevators, which will take you to your floor in a couple of seconds. Every part of the hotel has air condition, including all the rooms, complete with temperature regulators. There`s a WiFi hotspot in the hotel`s lobby, where you can for free, surf the web, check your emails and other stuff for free. The rooms have WiFi as well, but you have to pay a fee in order to use it. Housekeeping will daily clean and vacuum your room, and even wash, dry and iron your clothes, provided you pay a small fee. The hotel is equipped with its own restaurant, which serves breakfast and dinner. Breakfast lasts from 7 to 10 am, while dinner lasts from 19 to 21:30 pm. From June to September, the hotel organizes daily activities for all age groups, so everyone can find something to their liking. The beaches are clean and well kept, gravely and concrete near the hotel, with sandy beaches a bit far away. On every beach you can rent parasols, easy chairs, cocktail bars and showers, as well as equipment for recreational sea activities.